An inviting collection of lush botanical drawings to color. Each illustration is hand-drawn and printed on single-sided perforated pages for easy framing, and the book includes a few finished, fully colored botanical paintings to inspire would-be artists to draw their own beautiful works. Find it at Barnes and Noble, Michael's, Hobby Lobby, Joann's and Walmart Canada. The outdoors are magical to me. I imagine botanicals within playful wonderlands, mysteriously intertwining lines outside of reality. Being taught to paint realistically throughout art school and staying inside the lines always felt counterintuitive. Pressure to perfectly emulate the world wasn’t my solution, but I still loved art. Splashing acrylic on a fresh canvas felt right. Freelancing, teaching, and traveling continued to shape my pieces. I’ve always been in awe of the delicate beauty that Earth offers, from the prehistoric banksia flowers of Australia, to the ocean’s flowing undersea gardens and the ornate arrangements of California’s desert succulents. The biomorphic drawings in this book have been inspired by living in Australia for two years, surrounded by dynamic flora and fauna that I had never experienced before. The drawings in this book have been printed on one page each so that you can remove them for display or mixed media experimentation. Each hand-drawn illustration invites you to bring life to it through your own imagination. I recommend using Prismacolor colored pencils for the best results. To make the drawings pop, try using an analogous color scheme such as warm or cool tones. In my paintings, I love working with similar colors and then adding an unusual hue to enliven the dreamscape. Start with three to four colors and work from the lightest pencil to the darkest as you blend. Keep your drawing utensils sharpened and let creativity guide you! Just because there are lines doesn’t mean you have to stay inside of them. In this collection, I drew what I imagined. 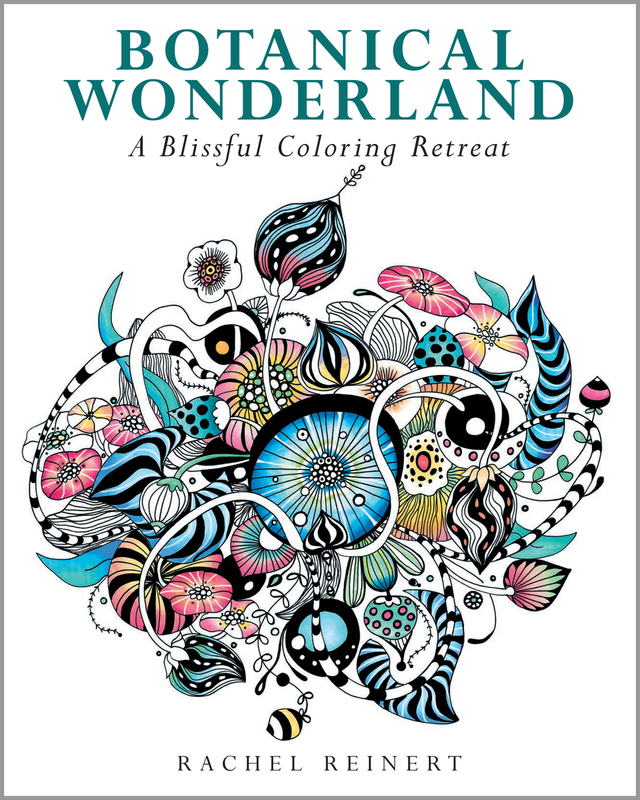 Similarly, I invite you to be confident in coloring in any way you desire—whether it be inside or outside the lines. My ultimate hope is that you find this book full of inspiring daydreams and allow yourself to be caught up in an imaginary wonderland. Bring life into a black and white world. Beautiful examples by colorists below! Discover the flourishing plant life and magical scenery of desert settings, all rendered in mixed media artist Rachel Reinert's signature style. This collection of illustrations offers a serene escape, evoking the calmness of desert landscapes and inviting you to bring your own colorful creativity to every page. Each hand-drawn illustration is presented on high-quality, single sided paper, with a perforated edge for easy framing or sharing. One signed, full-color print of Rachel's original artwork is also included to frame or use for inspiration. Explore a world of beautiful desert plants, mystical forms, and create a colorful oasis of your very own.